I may be sitting here in chilly drizzly old Scotland but my heart is still meandering along the shores of beautiful Lake Garda. 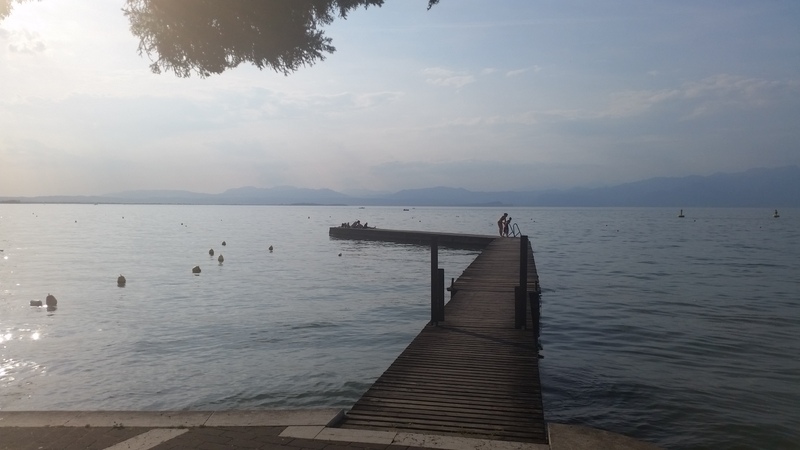 I was again lucky enough this summer to spend just over 2 weeks based in Peschiera Del Garda – soaking up the sunshine, watching the beautiful people and eating like a king. Yes this is the Italian edition of the Grumbling Tummy, packed with mouth watering highlights from my trip. 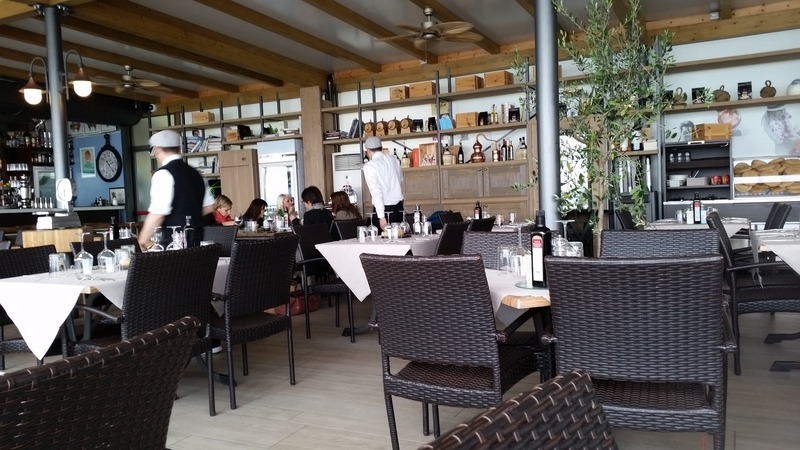 Most restaurants in the pretty towns and villages in Lake Garda are quite traditional in their style so it was lovely to experience something a little different when we visited Vecchio Mulino Beach Bar and Restaurant. This is only a 20 minute walk along the lake from the town of Peschiera – a walk that takes you past stunning homes, paddling spots, pedalos, swans and a little harbour. The lakeside location is stunning! There is a real buzz about this cleverly designed restaurant – it is airy and stylish “beach chic”. The menus come in the forms of hard backed books with stunning full page photographs of each and every dish – it was a real page turner. This stylish take on a menu made everything look so lovely it was hard to choose – but choose we did. 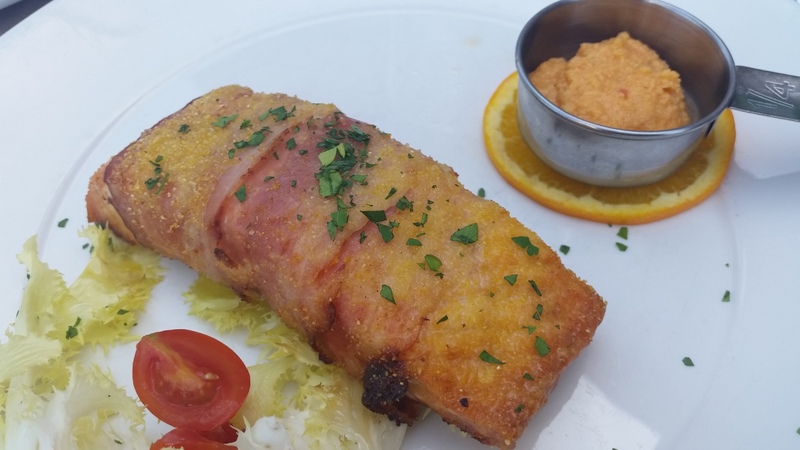 I opted for salmon with pancetta covered in corn meal and accompanied by roast vegetables in thyme oil. B chose stuffed anchovies. The highlight of my main course was the veg. 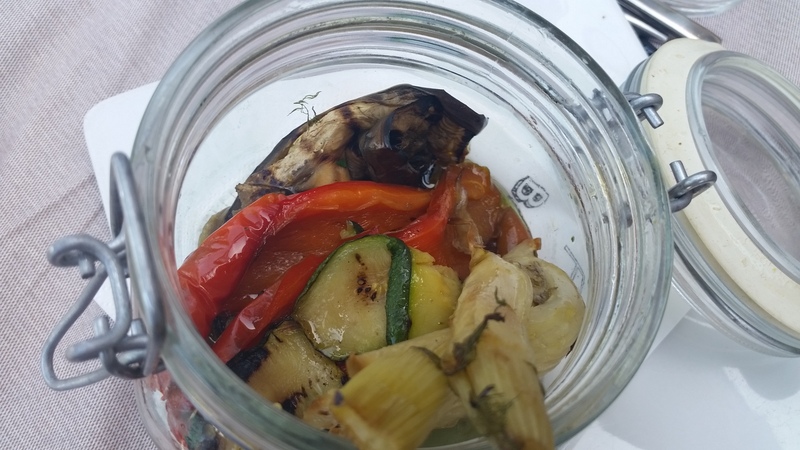 Slices of courgette, peppers and aubergine standing to attention in a beautiful glass jar and generously doused in fresh tyme and good quality olive oil – the aroma was tantalizing and the taste was none too shabby either. The salmon was perfectly cooked and altogether this was a lovely balanced healthy meal. I am always delighted when abroad to see fruit appear so liberally in the dessert menu and not just atop a chocolate torte but with pride as the main performer. It takes the guilt away from having a dessert and I do wish British restaurants would follow suit. 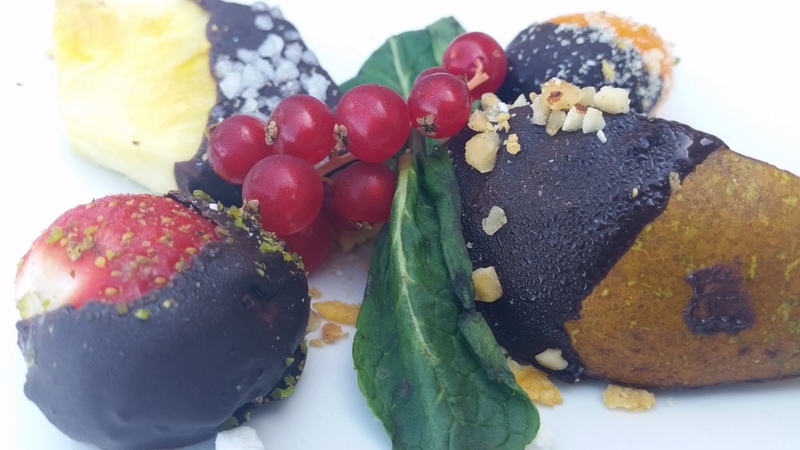 On this menu there were some simple yet stunning fruits doused in a little dark chocolate …… you need no more than that to please me. Delicious! 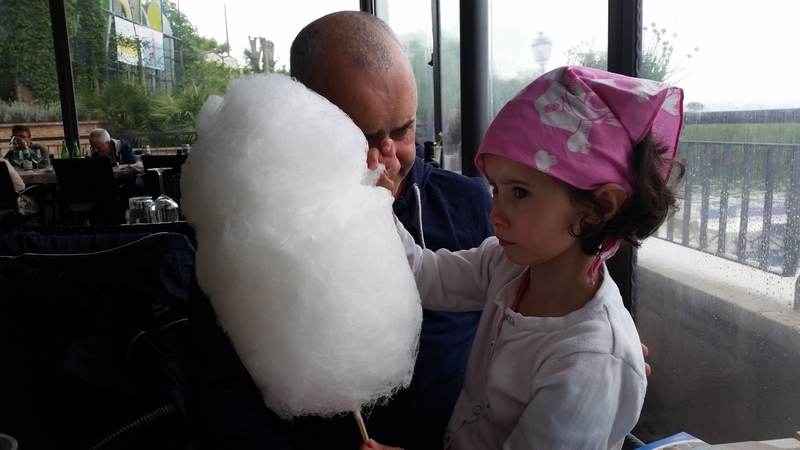 The meal seemed healthy until wee GT got her dessert in the form of a GIANT candy floss. Wonderful gimmick for the kids and unfortunately parents find it hard to keep their greedy paws away from it too. We were so impressed with this restaurant we returned there for our last meal, and despite there being a family of dogs (the size of small horses) in attendance (with their owners of course) it was just as lovely. This is what keeps you alive as a peely-wally Scot tottering around Italy in a mini heat wave. 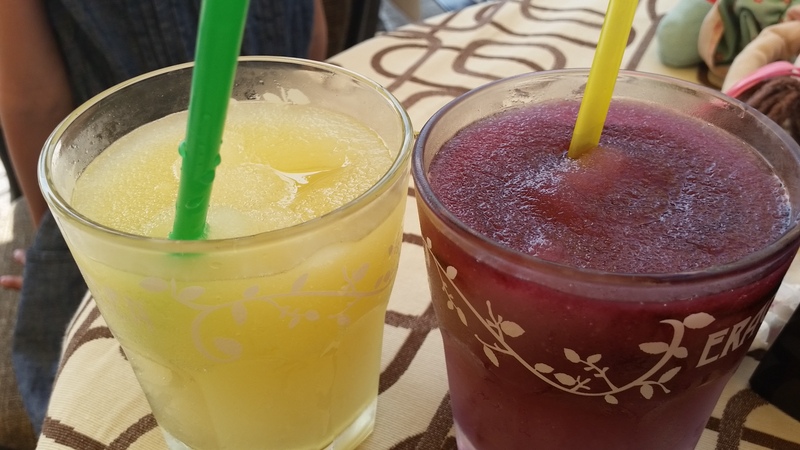 To the common man this is really a Slushy – but oh they do them so well in Italy. I have no idea if they are abound with sugar and chemicals but they taste much more natural than the specimens we have here. The flavours are fantastic – cherry, mint, strawberry, mango, melon and then of course the obligatory bright blue one (definitely chemical) which wee GT seemed to gravitate towards. On a hot day they are nectar and on the day we decided a 5 mile lakeside walk in 84 degrees was a good idea they were a life saver. 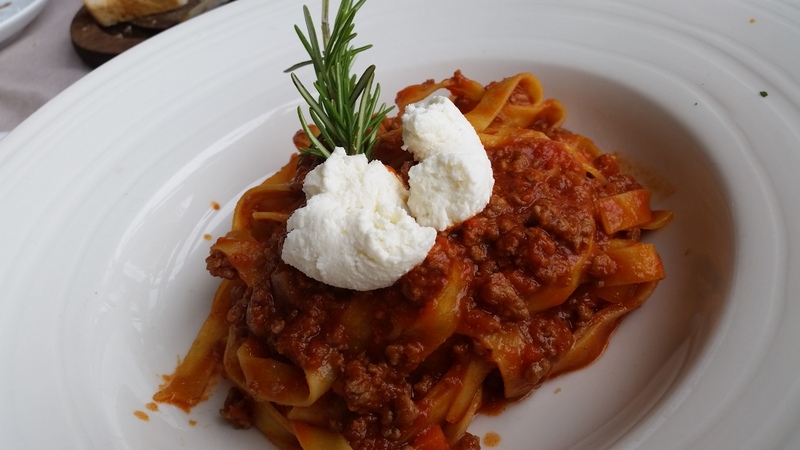 The fabulous thing about food in Italy is the freshness and simplicity of everything. Brian ordered Tuna on our final day and what arrived was a plate of very simply char grilled tuna topped with toasted sesame seeds. The tuna was was so fresh it was almost jumping off the plate. Having only ever cooked supermarket tuna (shameful but true) I believed that it was meant to be a brown gray colour – isn’t it?. Turns out this is not true – it is indeed meaty pink and mouthwatering. 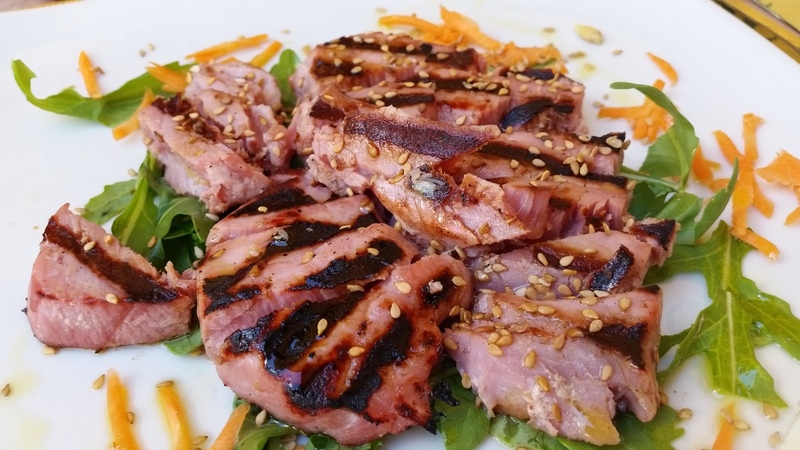 Veal is something which I remember eating as a young girl but as you know it is a meat which fell seriously out of favour in the United Kingdom. Not so in Italy where veal appears on just about every menu. 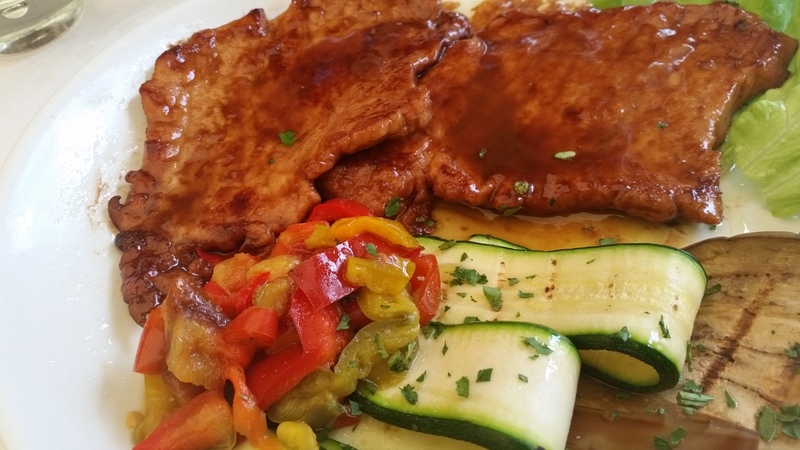 One of the most popular ways to serve veal is with a Marsala sauce accompanied by some simple roast vegetables. If you have not tasted veal it is pink and tender with a sublime taste all of its own – somewhere between pork and beef – It is quite subtle. The sauces in every restaurant were so fresh and intense and entirely lacking the glutinous texture of so many encountered here. I loved being reunited with veal. I know that in the UK we had an ‘ethical’comeback in the form of Rose Veal, but it is not really common place and people are generally still quite anti-veal. We are missing out. 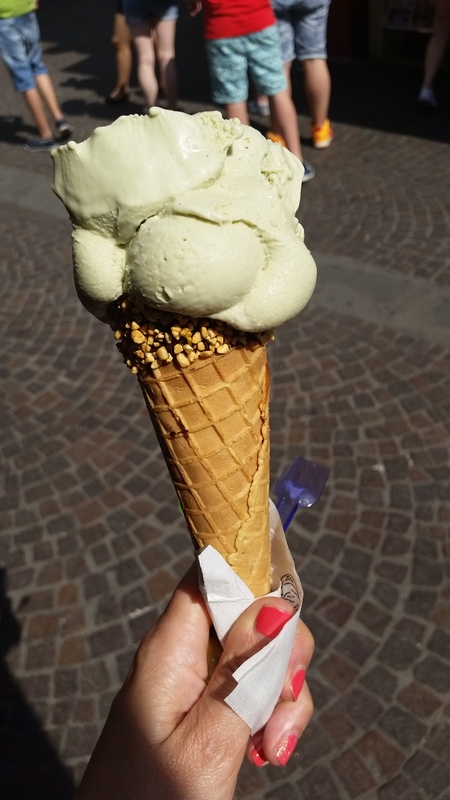 You cannot write a blog on Italian food without writing about the nations favourite GELATO! You don’t have to seek out ice cream in Italy, simply cast your eye down any street and you should be able to spot countless places to tempt you with their array of beautiful flavours. I find it hard to get past creamy pistachio and wee GT opts for the disgusting blue number (what it is it about blue food and this child) every time but there is a serious number of tempting flavours to be had and as well as traditional ice cream there is frozen yogurt and an array of sorbets on offer. On a hot day to somebody with a sweet tooth there is nothing more pleasurable than wandering along the narrow streets of a charming Italian town happily licking an enormous ice cream. Uno Crepe con nutella is a much used phrase when in Italy. Crepes are of course French , however the Italians seem to have embraced this sweet snack with gusto and there are crepes available on every street corner and on many menus. The most popular filling by far is nutella and you know how I feel about nutella – yum. The next best thing to wandering around a charming Italian town with an ice cream is wandering around a charming Italian town stuffing your face with warm crepe, gooey chocolate spread and a dusting of icing sugar. When your husband looks at you over a meal and delivers this line “this is so good it makes me want to cry” you know you are somewhere good. Last year we stayed in a fairly awful airport hotel in Milan on the way home. The surrounding area of Milan’s Malpensa airport is not exactly ritzy and there is nothing much going on . On arrival we headed out to the only restaurant near the hotel and all I could say was thank the lord it was closed. It looked less than appealing with its dirty white plastic chairs in the outside dining area. This shabby eatery looked more caff than restaurant. Fast forward to this year when we were staying at a much better hotel and had done our restaurant research. Trip Advisor praised a little restaurant called SARMANCANDA, awarding it many stars and rave reviews, and so the hungry travellers went on search of this oasis in a desert and lo what did we find – tatty restaurant from the year before. This time it was very open and called SARMANCANDA. We ventured in. The place was absolutely buzzing with a mix of airport hotel folk and lots of locals. The interior was really pleasant and not overly traditional with a proper bar area and the kitchen in full view – and let me tell you there was nothing manky about it. It was actually a pretty romantic candlelit hideaway if it was not for the five year old at our table. 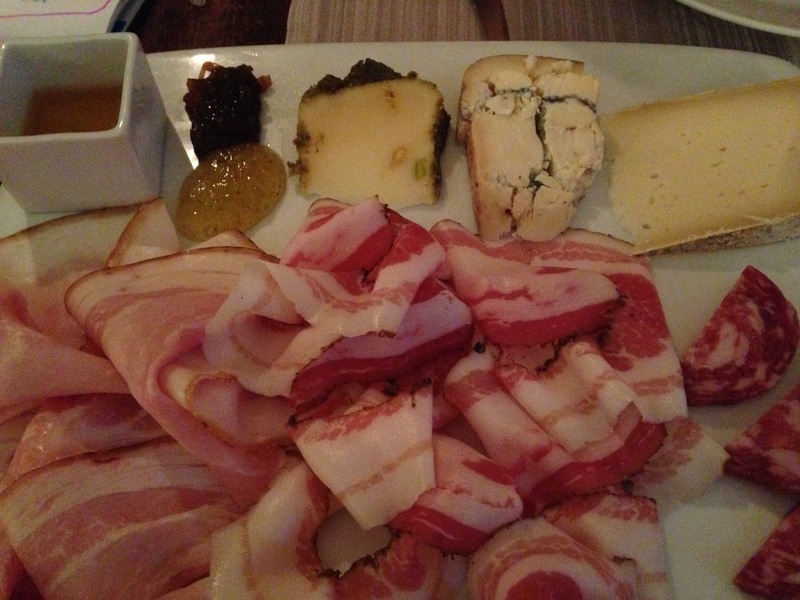 We had a deluxe anti-pasto of meats and cheeses to start. It was beyond fantastic (I think this was where B delivered his killer line) There was pancetta which was edged in cinnamon, an array of other fantastic local meats and three or four stunning cheeses. We asked the waitress about the cheeses and she was amazingly knowledgeable but not having expected this level of fabulousness I wrote nothing down. Sorry! The platter was set off perfectly with honey and an intensely flavoured carmalised onion chutney as well as a mild mustard dip for the hams. Had I not wanted a pizza quite so much I might have tried some of their special meals, which included rabbit, lamb and various amazing fish dishes. But I had a pizza which was beautiful and Bs Calzone was the size of his head and tasted marvellous. However the star of the show as far as I was concerned was dessert. In the more tourist orientated Lake Garda there is a standard fare of gateauxs, cheese cakes and ice cream sundaes in restaurants and I am not sure how much of these are actually made on the premises. 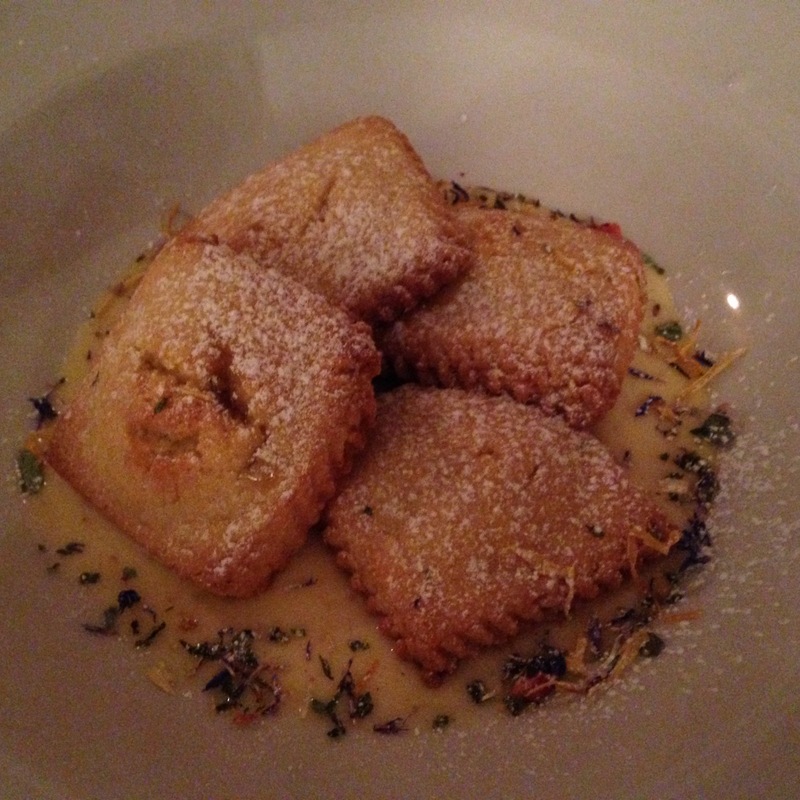 On this menu we found some beautiful home-made offerings including short crust pastry ravioli, filled with a ginger jam, delicately floating on a lake of vanilla, mint and thyme custard. This dessert was nothing short of sublime and the decision to share one portion was a bad one. I would recommend this restaurant to everybody who finds themselves floating around the area of Malpensa airport in Milan – go seek it out. The Italians are very child friendly – forever ruffling their hair or tickling them under their chin whilst murmuring bella bambina. Restaurants also welcome children with open arms but step away from the non tourist areas and you will not find a ‘children’s menu’. This is because in Italy children eat what their parents eat and don’t get the chance to opt for the dinosaur shaped nuggets and chips. Now I am not being high and mighty about this as my child lived off frankfurters, ,chips and air on holiday, I am in awe more than anything. As well as not cow towing to fussy eaters in restaurants you will not find much in the way of kid branded food in supermarkets. No spaghetti in the shape of letters, animals or peppa pig characters (god knows we looked!). Kids seem to eat …… real food. 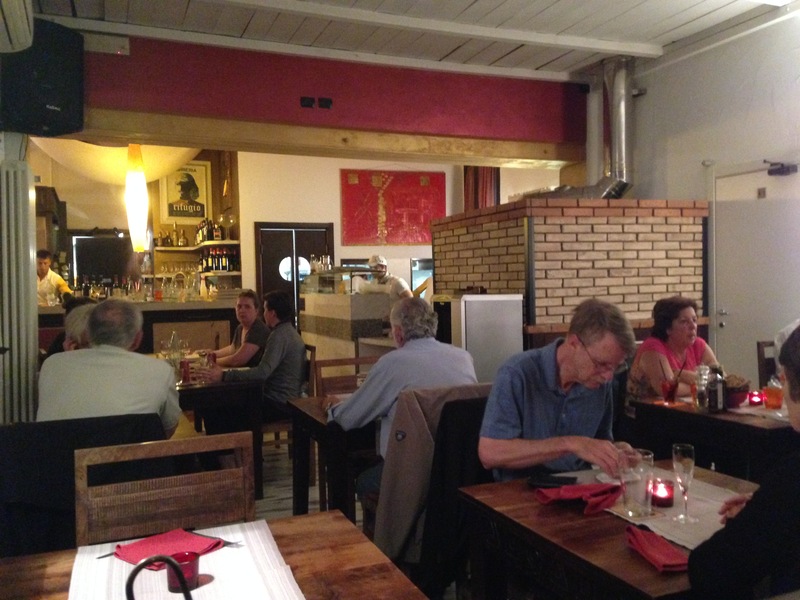 They are also welcomed into restaurants for dinner when our pre-schoolers are entering the land of nod because they tend to eat with the family and if the family is going out to eat at 8 then hell so are they – and it is really nice. They do have a siesta which helps them to stay up a lot later however I was more interested in the inclusion of kids in family meals. All too often I rustle up something for the wee one that “she will like” before packing her off to bed so that I can have something devilishly hot and spicy to eat and some peace and quiet. Perhaps I can learn something from the Italian way. My little girl has serious eating issues due to a medical condition so we might not manage to steer her away from the sausage so easily but we will be eating out with her in the evening more at weekends and also making sure that we all sit down together at least a few times a week for a family meal. I am sure I am not the only one who could improve in this area. So that’s it from Italy ………………… next stop Dublin!